With the darker evenings and cooler days, Autumn has well and truly got it's feet tucked firmly under the dining room table. Heartier bakes are on the menu and with Halloween just round the corner there's nothing more seasonal than a vibrant, sweet pumpkin. Talking of All Hallow's Eve, I'm writing this sat infront of the Halloween Strictly Come Dancing special (its another rock-n-roll Saturday night in the What Kate Baked household!). This is the extent of my Halloween celebrations. I've eaten all the chocolates intended for any trick or treaters. If I carve a pumpkin I'm very likely to end up with a pumpkin soupy-mush. And I'm too much of a wuss to watch a horror film. But I am all about the treat of course! 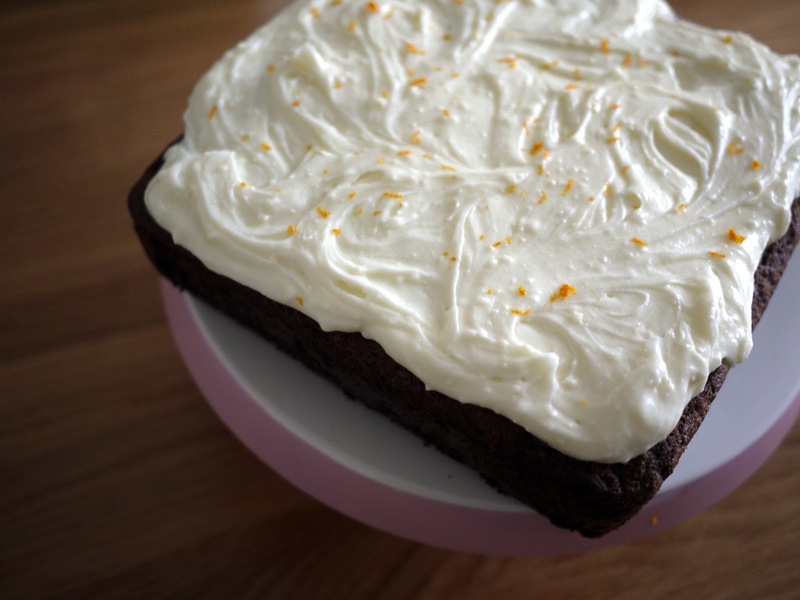 This recipe is from BBC Good Food. I adapted it slightly including reducing the sugar content, popping in some walnuts for a little crunch and adding some carrot as I'd read that pumpkins can have a quite considerable water content. 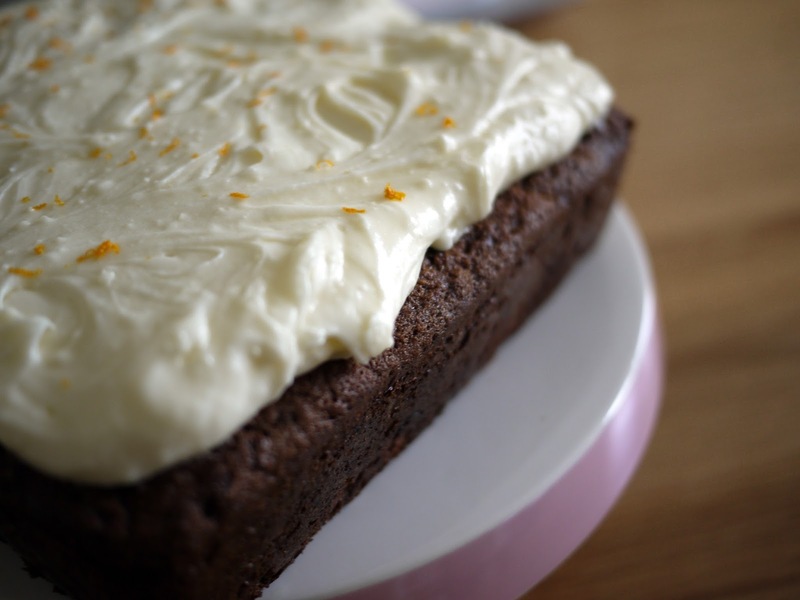 The cake is gently spiced, beautifully moist and the cream cheese icing adds an extra sweetness. 1. Heat the oven to 180C/160C fan/Gas Mark 4. Grease and line a 30 x 20cm baking tin with parchment paper. 2. Put the flour, sugar, spices, bicarbonate, sultanas, walnuts and salt in a large mixing bowl. Stir to combine. 1. Enthusiastically decide what to bake. Gaily flick through Nigella and Nigel's seminal works, admiring the beautiful photography and the mouthwatering descriptions. Consider baking a Flourless Chocolate Lime Cake with Margarita Cream until you take one look at your sous chef, aka the baby. Who is currently licking caked-on, dried-up porridge stuck to his socks from breakfast....two days ago. Decide your sous chef isn't quite up to the Flourless Chocolate Lime Cake with Margarita Cream. 2. Significantly reduce expectations of a culinary masterpiece and decide even Mary Berry had to start somewhere. Head to the shops for some rice krispies. 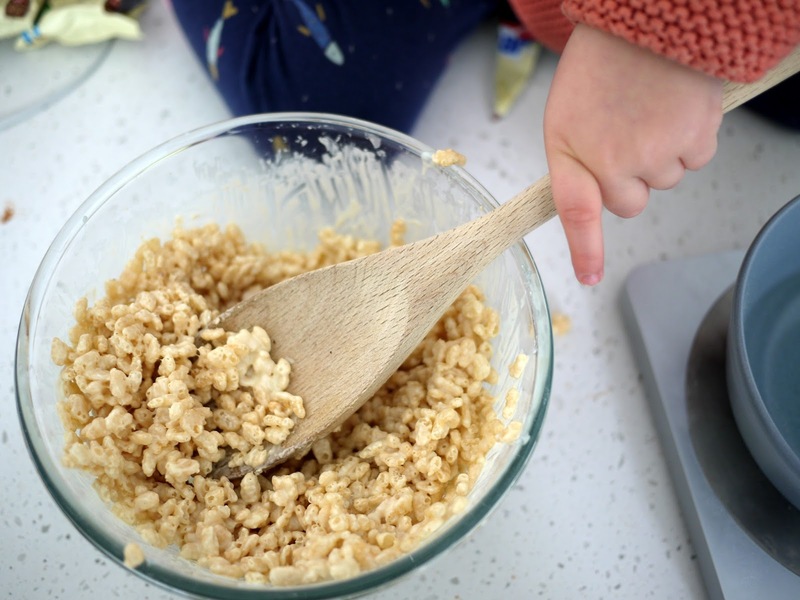 Yep, you'll start with that classic, the time-honoured, rice krispie cake.